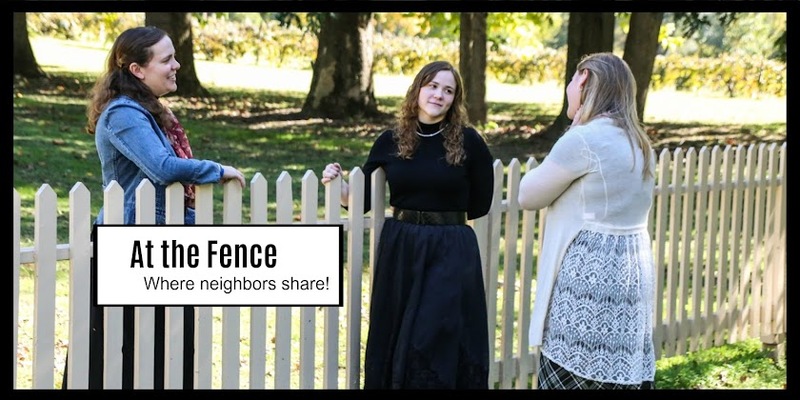 At the Fence: Dot to Dot by Monkeying Around! This is one of my favorite things to take on trips for keeping the children busy! Dot to Dot books from Monkeying Around are not your average dot to dots. These are amazing! 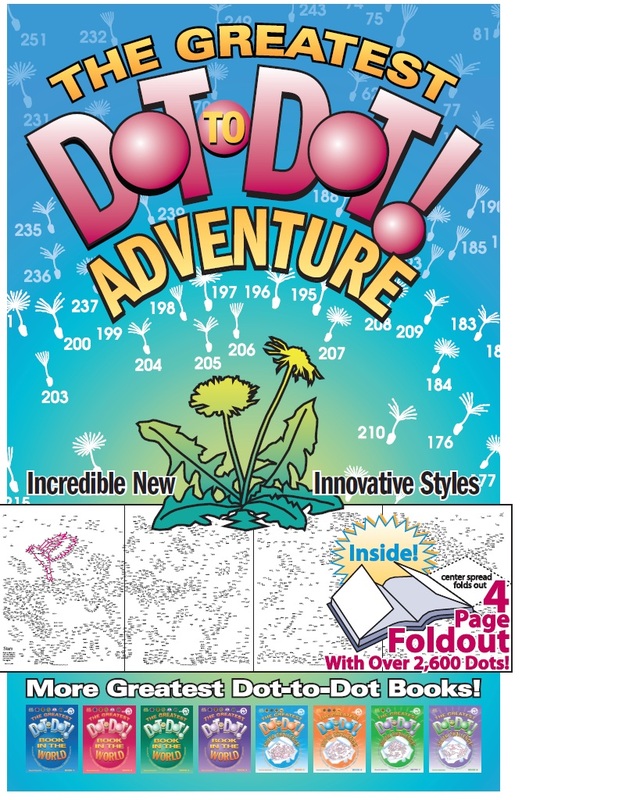 The new book we received The Greatest Dot to Dot Adventure Book 1($8.95) has dot to dots that are two and even three pages wide. My daughters LOVE to do these while we are driving, sitting at a restaurant, spending time together in the evening at a hotel, or whenever they have some free time. These Dot to Dot books by Monkeying Around have anywhere from 160 dots to over 1,000. Some of these are very detailed. I am sure you will be astounded! Each page has directions for you to follow, so you will know when to stop and start in a new spot. Some are numbers, a few are alphabet. A couple have numbers but no dots. They are really alot of fun! This one is a little boy in bed. Since 2000 Monkeying Around has been dedicated to offering innovative dot-to-dot products that will delight and entertain children and adults of all ages. 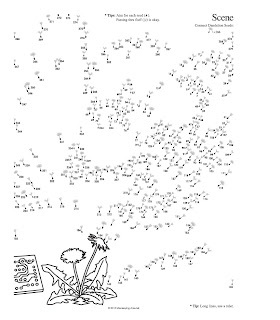 We are pleased to offer "The Greatest Dot-to-Dot Books in the World" (Original Books 1, 2, 3 & 4), a challenging collection of unique dot-to-dot suprises and variations. 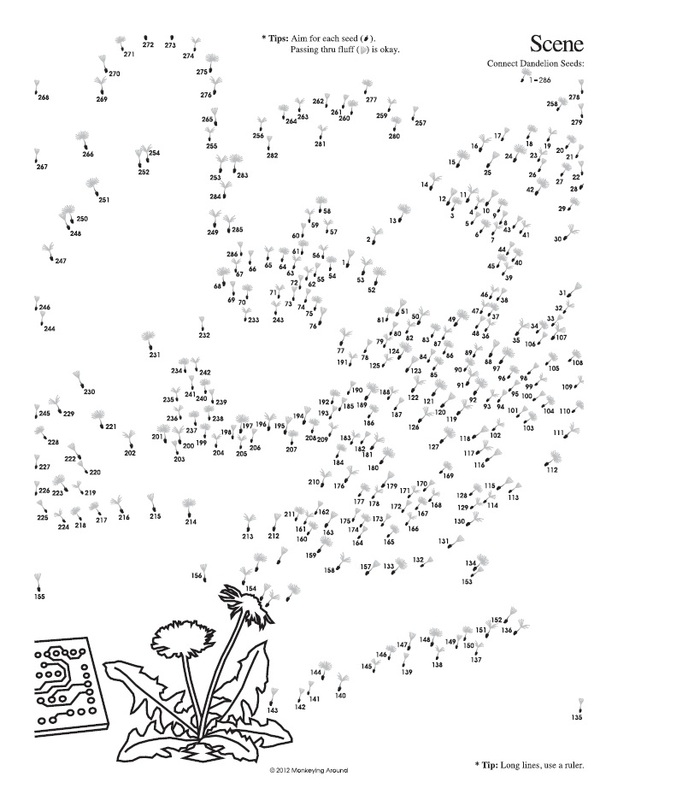 We are also pleased to offer "The Greatest Newspaper Dot-to-Dot Puzzles" (Vols. 1, 2, 3, 4, 5, 7 & 8), pocket / travel sized collections of weekly syndicated puzzles published in the pages of USA newspapers. 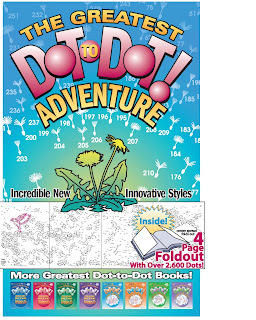 In 2007 the first of the "Greatest Dot-to-Dot Super Challenge" (5, 6, 7 & 8) Books was introduced with Book 5 and Book 8 in 2010. We have actually worked in several of the Monkeying Around Dot to Dot books. Several of the dot to dots when completed could even be colored or painted and then hung on display. We actually met Monkeying Around at ChiTAG (The Chicago Toy and Game Fair). She is starting a 3 pager! 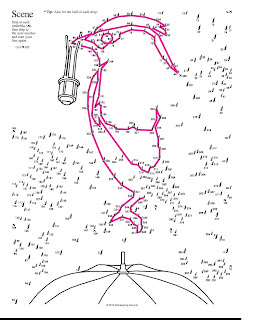 "I have looked on Ebay and collected dot-to-dot books dating back to the 1920's. I know they went back much earlier than that. In my books I even made humorous references to the history of dot-to-dots, because I personally couldn't find the origins. There was a book that inspired me but I don't know the title, author or date (probably late 60's or early 70's). I remember the puzzles having lots of numbers and the images being fairly detailed. At that age lots of numbers may have been 50 for me, but it seemed like so many. As an adult I would occasionally create a dot-to-dot puzzle just for fun. I came to realize that all the dot-to-dot books available were for young kids just learning numbers, with drawings that gave away the final pictures. I decided I wanted to design a really intricate dot-to-dot puzzle book for the big kids, with lines wandering all over the place and numbers climbing well into the hundreds. 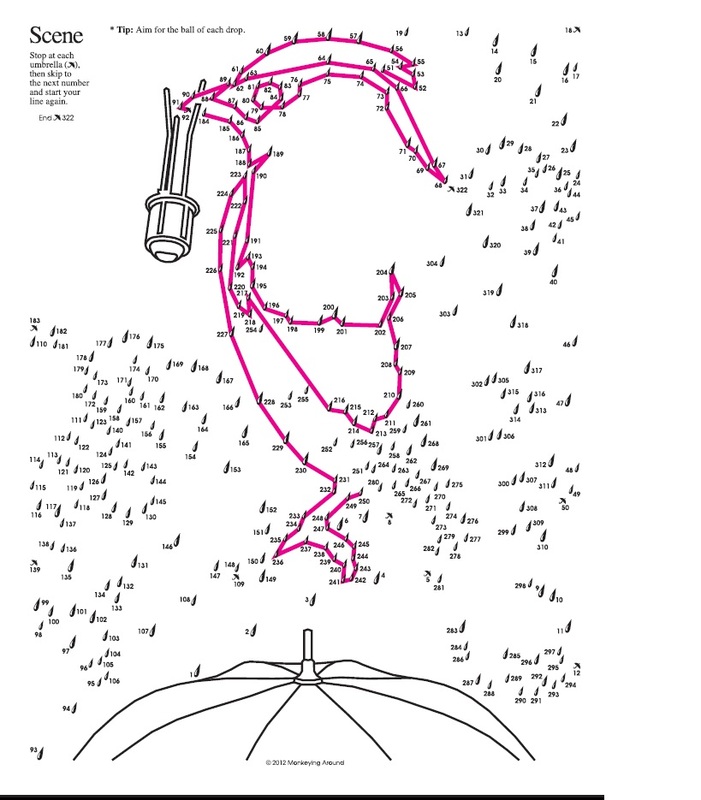 While working on and off for seven years on this goal, I came up with new dot-to-dot puzzle variations involving multiple lines, connecting coordinates and even connecting symbols." You can find the Monkeying Around Dot to Dot books at local merchants, online catalogs and stores, or you can mail or fax in your order. These books would make great rewards for good grades, prizes in contests at school, birthday presents, or just because. The Dot to Dot Books are available with different skill levels too! Be sure to "like" Monkeying Around on Facebook. Then stop by and follow them on Twitter! And if you would like to try one first, they have a couple of samples you can download on their website! Set 1: Book 1, Super Challenge Book 5, Adventure Book 1 (autographed), Newspaper Book 7, Included with the Adventure book is a very special, very limited item. Set 2: Book 3, Super Challenge Book 7, Adventure Book 1 (autographed), Newspaper Book 8, Included with the Adventure book is a very special, very limited item. My son pulled out a dot-to-dot book earlier today, but I can't remember the last time I did one myself. About 20 years ago for myself but my grand wee one LOVES dot to dot books! I think it has been years since I did a dot-to-dot. The last time i did a dot-to-dot was probably 50 years ago. Actually probably last week while helping my kids. We really enjoy them. I honestly can't remember when I last did a dot-to-dot - probably at some restaurant perhaps in the last 20 or 30 years. Ever since I was a kid, I love dot-to-dot books. A couple of years ago, I found dot-to-dot books made for adults. I ordered them all and did them...so much fun! It was in the last ten years. I did a dot to dot with my kids over the summer. They are a part of my son's fine motor therapy so we do them weekly. It has been at least 15 years! The last time I did a dot to dot was when I was waiting in the doctors office, a few weeks ago! It's been several years since i did them with my kids. I just did dot to dot with my daughter on Sunday. Probably over 20 years ago. I have done them recently with my 7 year old grandson. I'd say it's been a 5-6 years ago. I think when my daughter was in Kindergarten. It has been years, no idea how long! These look awesome!! About a week ago with my little girl. I cant remember the last time! May have been while babysitting a good 10 years ago. I havent even done one with my kiddos! I have no idea when the last time I did one was. Probably at least 10 years ago. I cannot remember how long it has been! Probably at least 35 years! It's probably be 10 years or do since I've done a dot to dot but I still love them! I haven't done dot to dots since I was a kid. It has been a long time since I have done one, but the kids I watch love doing things like this and it would be a perfect activity! it has not been that long for me since I still have younger children, probably a month ago. We do them together still. Since I was a kid.. i'm sure my kids would love these! I haven't did a dot to dot since middle school math class. We used to have to use math to find the position of the dots and then connect them all together. It was really fun! I remember doing one when I was a little girl. Loved it. Used to do them all the time! Wow!! It's been a real long time, but they're such a good time. :D I think the last time i did one was as a child. It's been probably 20 years but I'd love to help my son with one! It has been many years since i have done a dot to dot but my son is almost ready to do them. I actually did a dot to dot last week when I was hospitalized. The last one i did by myself has probably been 30 years but i did help my 6 year old with one the other day for homework.